Today I took off the medical tape, and it’s off for good. Now it’s on to scar cream and other remedies for a more extended period. I bought a general scar oil today (Palmer’s Cocoa Butter Scar Therapy), and a scar gel (Derma-E), although it seems the gel gave me slight redness. This needs to be slathered on at least 5 times a day, for a few months. The incisions are still a mighty red, and there are tiny scabs leftover here and there. The hyper-sensation feeling – the unceasing discomforting tingling that was almost painful all over my chest – continued until late last week, and I firmly hope I’ve made it past that stage. Overall sensation is great; nothing is really numb, other than the area right on top the scars, and even there I feel general pressure. This is logical, since nerves were split at joined together at different endings, so it will obviously take time for that tissue to fully regenerate. The contour, as I keep repeating, is great, and as it heals I keep thinking how natural it looks. The drain sites are not as prominent anymore, and the swelling has gone down. Except for this week, which is when my hormones decide to act up and my breasts used to get swollen to 150%, except now they aren’t my breasts, they’re my pecs. I swear this happens every month… So bear in mind when looking at the photos that my chest is probably slightly more swollen than in should be, for hormonal reasons. I’ve begun a full regime of exercise, which includes a grand total of two 30 minute walk lasts week. Needless to say I’m out of shape and I’ve gained some weight from being mostly unable to do more than computer sitting and basic walkable transportation. But the walks felt great, I hope to continue them this week, and get back into shape so I don’t hyperventilate after a flight of stairs. As for movement, I can reach anything up to shoulder level, which at my already challenged height is about the first level of the kitchen cabinets, but enough to get at the chocolates and other yummy goodies (all the more reason to go on those walks). It doesn’t help (but I’m not complaining) that my honey pampers me a lot, and won’t let me wash not even one dish. Trust me, I’m making the best of it while it lasts. My chest still hurts a little during the night and in the mornings, as I’m a side sleeper and this is probably not the best position for it. And later in the day I might get uncomfortable. In general I’d say pain is down to 0.01, statistically significant to p<0.05. I'm also very sensitive in that area to anything, like the zipper on my jacket through three layers of shirts and sweaters. After the 2nd week I didn’t have to wear the ace bandage 24/7, but I kept wearing it for the third week because it felt better. Then the fourth week I still had the medical tape on, which was acting as a kind of safety blanket barrier. Today was the first day I put on my shirt bare-chested. Honestly, I still feel naked when I put on a shirt. I feel like I need to put on a bandage, or something. When I’m getting dressed, I’ll put on my underwear and then stop for a second, as if something was missing. And something is! Then I smile, and stare down at my chest, in memory of those 30 seconds I would have spent putting on a now unnecessary article of under-clothing. For the past 10 years, I’ve never left the house without it, and now, I do, as if that were appropriate. But now it is! It’s a strange disconnect. If only you could see the smile on my face, that just keeps getting bigger as the days go by. Every day that passes the belief that this was the right thing is doubly affirmed. 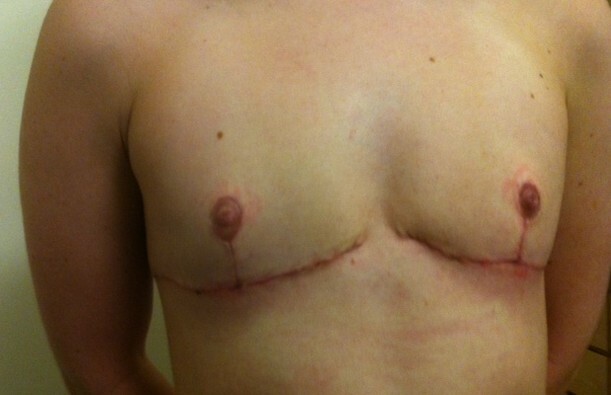 I grow more convinced that my new chest does, indeed, make me very happy. Which was the end goal from the start. Your chest is looking so great–congrats on the one-month mark! You look great! I’m happy that it’s going well for you and you’re feeling good about things. I’m surprised you have to use the scar cream so often, but I have never had to use scar treatments before. Did you do research into the oil and gel first and get recs for those? I think one of the things I expect to weird me out the most is not wearing something under my shirt. It must be strange. But nice! And probably better in the spring and summer heat. Every shirt I put on is a new adventure, because I don’t know how it will look on me. I’m actually wearing one today that I hadn’t worn for a few years, for two very particular reasons… and it looks great! It’s so liberating. Look at that handsome little person!